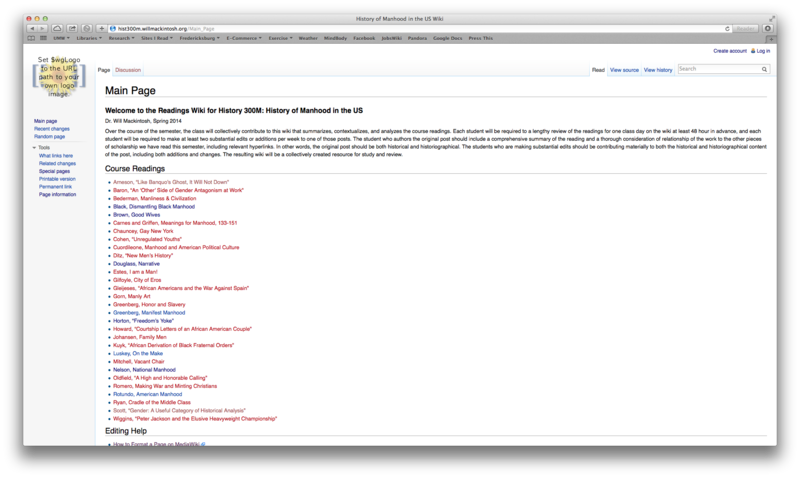 Screen shot of the wiki in progress; click to enlarge. This semester I am experimenting with using MediaWiki as a platform for the students in my History of Manhood in the US course to build a collaborative set of reading notes. After being less than completely satisfied with my Twitter experiment last semester, I was looking for a new way to integrate an online component into my courses. One of the problems I had with student tweeting is that it generated a lot of noise; there was a lot of talking and very little listening. I had a hard time keeping up with all the tweets, and it seemed unreasonable (as well as unproductive) to expect the students to do so. In previous years, I had found that response-blogging suffered from a similar problem; there was an awful lot of expression and not a lot of contemplation. So I found myself searching for a different kind of online community, one in which the students wrote less but more thoughtfully, and actively engaged with what the others were contributing. 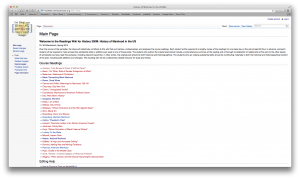 Borrowing an idea from my former colleague Matt, I decided to try using wiki software to get the students to build a collaborative set of reading notes over the course of the semester. The assignment appealed to me because the students would be writing less (only two “original posts” per semester) but reading more (two required “substantive edits” per week). The work would unfold at a slower pace than on Twitter, giving everyone more time to absorb it. And finally, it would serve a purpose by creating a useful resource for study and review, rather than just disappearing into digital thin air. So far, it has been working well, although it’s only the fifth week of the semester. The students seem to be taking it more seriously, and what’s more, the pages they have created have so far been of much higher quality than any of my tweets or blog posts ever were. It turns out that the collective student hive mind has a reasonably sharp understanding of the material. Thank you for posting this – I think this is a great idea and may borrow it in a future class.